So, I've been trying to think of inexpensive ways of bringing a little fun to a night at home. Yesterday I tried a Date Night surprise. Complete disaster. We had Tinker, Tailor, Soldier, Spy on Red Box. I wanted to get creative and plan the menu around the movie, but it was set in England. Let's face it - it's not a country known for tasty food. (Sorry, Brits.) So, I went long. We have Guinness in the fridge, so I planned on picking up two orders of Shepherd's Pie from a local restaurant where it's REALLY good. Restaurant is closed on Mondays. Okay, so hubby picks up burrito's from our fav Mexican place, instead. I go to pour us each a Guinness and realize that my tummy's a bit...queasy. He skips the beer, too. Limoncello (It's in the movie... and it's chilling in the freezer.) . I usually get all the ingredients out first. Then I put a pot of water on to boil and start the sauce at the same time. The entire recipe takes only 15 minutes! In a saucier or large sauce pan, melt the butter. Sprinkle on the flour. Whisk together and cook about 2 minutes until the paste smells a bit nutty and is a light brown. Pour in the half and half. Whisk. Pour in a cup of the milk. Add the rosemary, pepper and some salt to taste. (If you aren't a big fan of rosemary, cut the amount in half. Continue whisking until the sauce thickens. Add the rest of the milk as necessary. (Make it a bit watery as it will continue to thicken.) Cook the pasta according to the directions on the box. Before draining, reserve a cup or 2 of the pasta water. Drain. Combine the pasta and sauce. If the sauce gets too thick, stir in some of the pasta water. Serve. Makes about 6 side dishes. About 3 entrees. I don't really measure my ingredients for the bechamel sauce. It's pretty much the same technique as our Sausage Gravy Recipe. Sometimes I use mostly milk. If I have some heavy whipping cream leftover in the fridge, I'll toss some of that in. I use whatever dairy is on hand. And, if I had a sprig of fresh rosemary, I would toss that in, too. Since we're going with an Italian theme, I almost made my Chicken Pesto Cavatappi - a Taste-Alike from Corner Bakery. But, we've had that a lot recently. 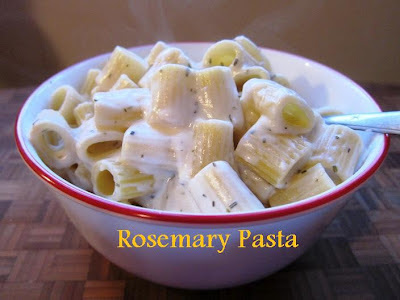 Oh, I should mention that this Rosemary Pasta is also great with some chicken tossed in. and the hubby is on his way home. Do you have at home date nights?